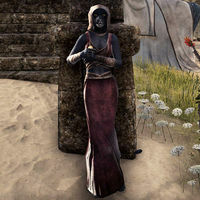 Falana is a Khajiit commoner found in the city of Sentinel. She walks back and forth between the base and midpoint of the stairs west of Red Feathers Horse and Bridle. At the bottom, she leans against the lamppost and flips a coin; at the top she looks out toward the southeast. When spoken to, she comments, "The dry side of the city is best, yes? Less salt on the whiskers ... and fewer guards." This page was last modified on 20 July 2018, at 00:27.